Purpose: Knowledge of anchoring techniques will help you to decide your own emotional state and influence that of others. 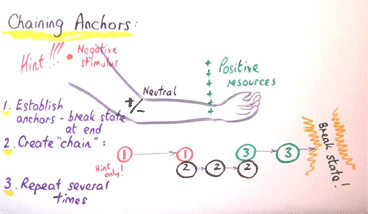 An anchor is any stimulus that evokes a consistent response pattern from a person. It can be any stimulus that is received via any of the five senses, singly or in a combination. 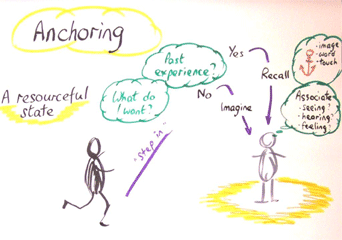 Anchoring is the tendency for any one element of an experience to bring back the entire experience. Stacking Anchors: Where a series of states (e.g. resourceful states) are anchored using one anchor only. This increases the power of the state anchored. Chaining Anchors: Creating a situation where the firing of one anchor will trigger a sequence of responses (e.g. to take a person from an unresourceful state to a resourceful one). Collapsing Anchors: Firing two or more anchors simultaneously to integrate two anchored states (e.g. to integrate two ‘parts’ of a person that have been dissociated from one another). Purpose: This process enables you to anchor a specific (resourceful) state of mind and being that will then be available to you at anytime you wish. This is a very easy exercise to do for yourself as well as for others. “Remember times in the past when you have had this experience.” If there is no actual memory of experiencing this state then proceed ‘as if’ you are experiencing it. “How are you beginning to feel as you re-live this experience? … How do you know this feeling is increasing? … I don’t know how easy this will be for you … but what happens if this feeling increases by, say, 10% … 20% … even 50%?” Step out (this breaks the state) and check what else would make it even better for them. In addition, ask them what sort of anchor they would like to use, for example, an image, a word/phrase or a physical touch of some kind. This will become the trigger to bring back the experience for them. Step back in and add the extra elements as necessary, helping them to build the state all the time as above. As the peak approaches, anchor the state using the specific trigger suggested by the coachee. Invite them to step back out of the circle. Pause for a short while, and then trigger the anchor. You should get a full representation of the experience. If not, build additional resources as necessary. Purpose: A process that enables you to change your response to a trigger or stimulus that is likely to continue to exist. Once the chain has been established effectively it should run completely instinctively, and give you real choice about how you feel. Invite your partner to briefly think about what has triggered their historical response. As coach, anchor quickly and invite them to “let go of that feeling”. You only want them to experience a tiny hint of the starting negative feeling. “Now remember times in your life when you’ve felt neutral or ambivalent … Take yourself into that state of mind now.” Anchor that feeling through a second touch in a different physical position. “What resources would be important to you in your future handling of this situation? Taking that first resource/strength, remember when you have had that feeling … See it (as fully as if you are really experiencing it) … hear it … feel it.” Anchor on the third specific location and repeat each positive state individually on exactly the same spot. Break state at the end. Fire the anchor for the negative trigger and almost immediately add the neutral anchor. As the physiology of the neutral anchor appears then release the negative trigger. Give this a moment or two to develop and then fire the resourceful anchor while still holding the neutral anchor. As you see the physiology of the resources developing you can then release the neutral one. Break state at end of sequence to ensure the pattern only runs one way. What happens when they trigger their memory now? Calibrate their response – you should see the physiology of the resources appearing almost immediately. If not, repeat the chaining process. Or, build more positive resources and then chain again if required.